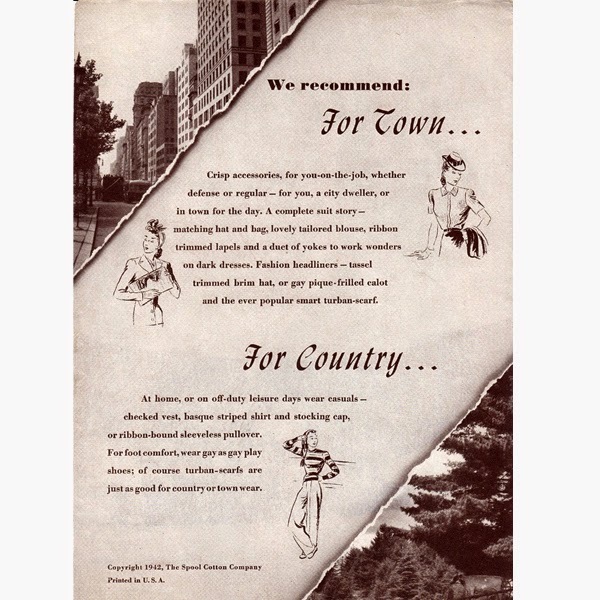 The year was 1949, Harry Truman was president, cable television debuted, Milton Berle hosted the first telethon for cancer research, a postage stamp was 3 cents and needlework arts continued to be immensely popular. 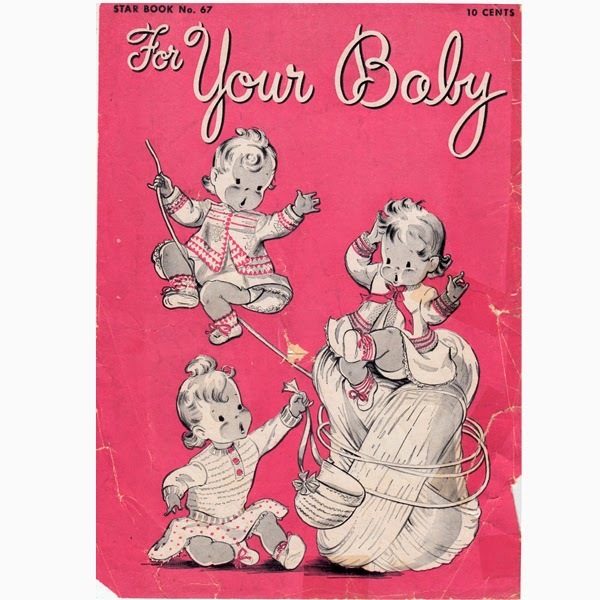 In promotion for their line of Dawn Baby Yarns (Baby Yarn, Infants Wool, Pompadour, Medium Weight Pompadour, Anti Shrink, Paradise and Zephyr), American Thread issued their Star Book No 67 - For Your Baby. The book contains 14 patterns; 7 Knit and 8 crochet. The pattern designs covers babies between 6 months and Size 3. No 6701 - Crocheted Baby Jacket, Bonnet and Booties is worked in a delicate shell stitch with solid yoke and contrast stripes. It is sized for baby 6 months to 1 year. offered as a free download in the shop. No 6704 Nylon Play Pants are knitted with suspenders affixed with buttons. The short pants are Size 1.
but made interesting with side button appeal. Free Download in the shop. 6707, 08, 09 - Crocheted Baby Bibs in three different styles. A design here to suit every baby. No 6711 Knitted Sweater and Cap will give baby that stand-out look in this knitted set. It is sized for baby at six to twelve months. Crocheted Dress No 6712 is sized for little girls 2 and 3. She'll love the little Peter Pan collar and buttons, and everyone will love the way she looks. jacket, bonnet and booties; all size 1. The back cover is the same as the front cover. Although the pictures are not of great quality, all of the patterns are quite delightful. If you are wanting to make something special for baby and you can't find something in these vintage designs .... well, what can I say ! I've listed the patterns in the shop, should you be interested. There are, of course, many other knitted and crocheted baby toddler designs if you'd care to browse the categories. Thanks for dropping by to read my book report. The next book up in my stack was an oldie (but goodie, of course), from the Spool Cotton Company. 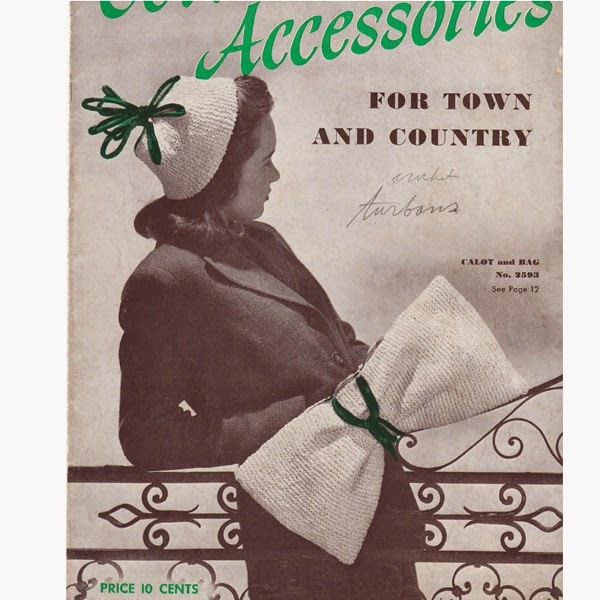 Named Cotton Accessories for Town and Country, Book No 180. 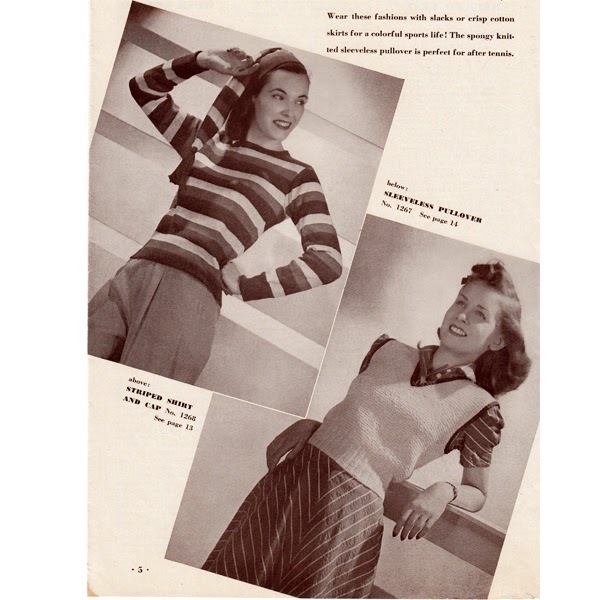 The pattern book, dated 1942, was issued to promote their (then) line of J&P Coats Cotton Lines - Mercerized Crochet Cotton, Bedspread Cotton and Knit-Cro-Sheen. The patterns are geared towards the adult female and even include a pair of crochet shoes. If you are interested in seeing the contents, well .... grab some tea or coffee, get comfortable and .... let's go. The second page is a cute promotion for the patterns that follow. Here are the first two of three collars featured in this book. 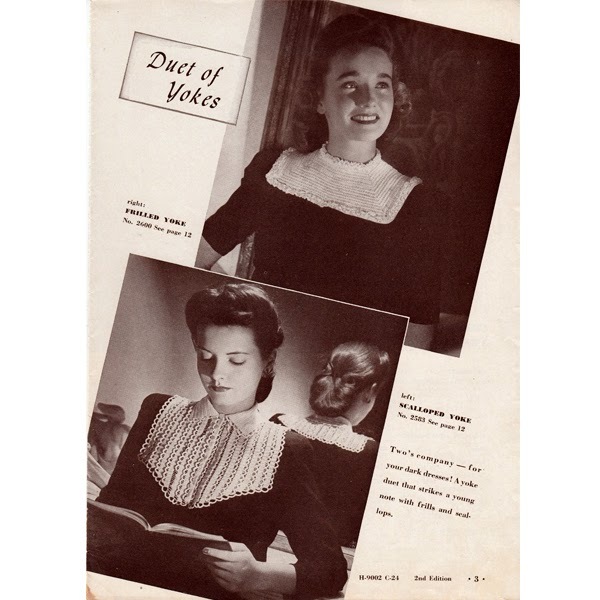 The Frilled Yoke, a squared design with small frill at the neck and border. The Scalloped Yoke has soft and pretty scallops forming rows and a small notched collar. This Checked Vest is quite an attractive piece. Crocheted in three shades; checked on the front and solid on the back. It is sized for misses 14, 16 and 18. The Striped Shirt and Cap is a three color affair in as bright or demure colors as you might wish. The pattern includes the stocking cap. The Sleeveless Pullover is knit, with some crochet detail. It's a quite easy pattern in garter stitch that a beginner could easily tackle. Three hat designs -- all very easy. 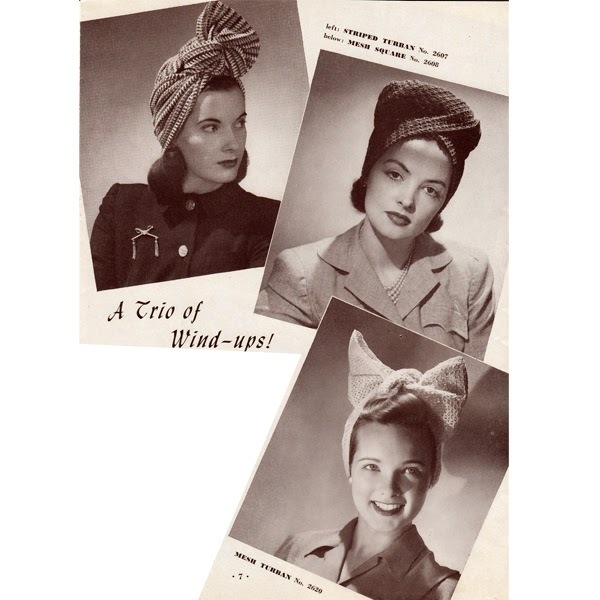 Pattern 2607, Striped Turban (top left), is a wrap & go design in three colors. Pattern 2608, Square Mesh (top right) is a crocheted band folded into the attractive shape. Pattern 2620, Mesh Turban, is crocheted in a triangle pattern stitch and tied into a bow. This pattern is offered as a free download in the shop. Hat and Handbag Pattern No 2594 are easy designs with plenty of ribbon adornment. They are worked in an attractive star stitch. The standout (bottom) is a set of Collar Lapels No 2589 that have velvet ribbon laced along the edges. This pattern is also offered as a Free Download in the shop. This Classic Blouse, No 1266, has a delicate lace stripe pattern stitch with fitted short sleeves and a notch collar. A perfect dressy compliment to many an outfit. 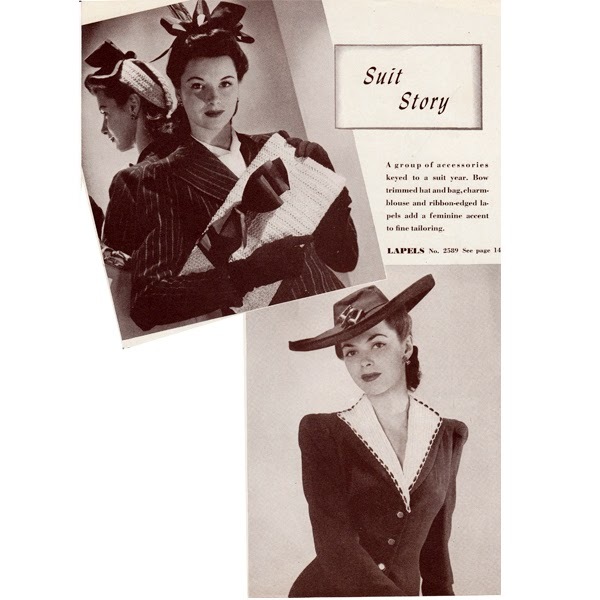 Brimmed Hat No 2623 (top) has a jaunty brim and fun over-sized tassel. The Lingerie Calot No 2621 is a simple, yet elegant affair with eyelet flower and grosgrain ribbon bow. They are calling these cute wedgies Play Shoes No 214. Sized small, medium and large and worked in heavy rug yarn. I always enjoy going through these old pattern books. 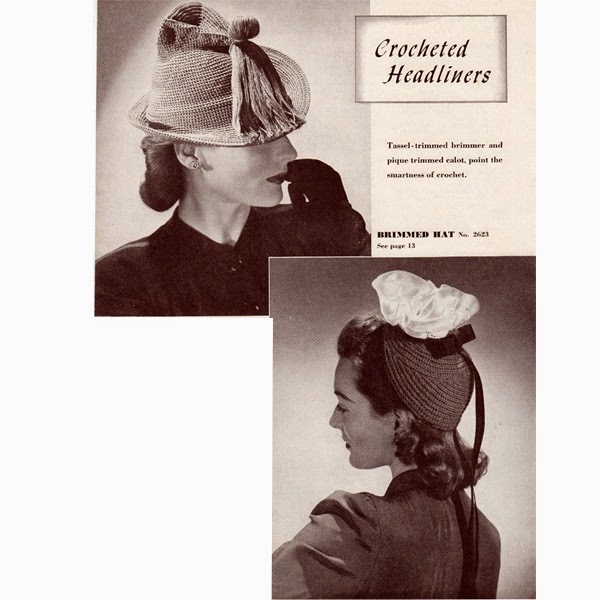 This book has plenty of accessory designs that can be as useful to your wardrobe as they were in 1942. I particularly like the Striped Pullover and Cap. You? What is your favorite?